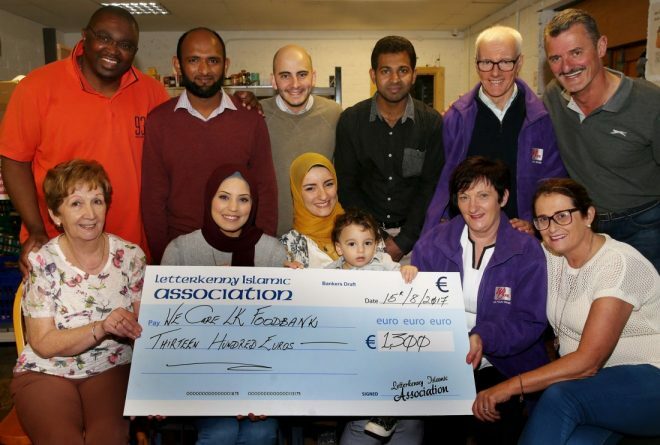 DONEGAL’S Muslim community has used its annual observance of Ramadan to raise €1,300 for Letterkenny’s food bank. Members of Letterkenny’s Muslim community presenting a cheque to the staff and volunteers of ‘We Care LK Food Bank’. The money was raised during the annual observance of Ramadan. Ramadan, when Muslims give up food for a month, ran this year from May 27 to June 24. As part of the month long fast, Letterkenny’s Islamic Association invited members of the non-Muslim community to join them for a day. They were asked to gather as much sponsorship money as possible and that cash, along with donations from local Muslim families, was handed over on Tuesday. The donation was a beacon in what has been a difficult few weeks for volunteers at ‘We Care LK Food Bank’. Their premises just off Letterkenny’s Main Street was targeted by burglars twice in as many weeks recently. Amir Gamil of the Islamic Association said that for Muslims, Ramadan was about sacrifice and that through their month long fast, they could identify with those going hungry in Letterkenny. He also said Muslims were keen to show what Islam is really about and not the “crazy people” committing atrocities like the Manchester bombing. “We wanted to do this as part of an effort to give something to the community,” Mr Gamil said. “During Ramadan we fast from dawn until sunset and the reason we do that is to experience what it is like to go hungry. “It is heartbreaking to think there are people here in Letterkenny who are also experiencing that but the fact that the food bank is doing the work it is to alleviate their pain and their struggle is amazing. “Being a positive influence on the community is part of our religion and holding a fundraising event like this is something we have been talking about for a while. “With some of the awful things that have been happening, we decided this year should be the year because we wanted to show people that this is what Islam is really about and not what some crazy people are doing out there. What they are doing is not Islam,” he said. Chair of the ‘We Care LK Food Bank’, Christy Galligan thanked the Islamic Association for the gesture and said it showed how integrated Letterkenny and Donegal had become. “It is a huge gesture by the Muslim community and what it shows is that the food bank does not discriminate and that we are here for everyone, regardless of colour, creed, religion or sexual orientation,” Mr Galligan said. “The burglaries were a big blow for us but we are bouncing back and this money will be put to good use helping families across Donegal. “We also have overheads like our van which needs fuel and needs tax, so it will all go towards keeping us on the road as well.